Lock in a great price for Playa Los Angeles – rated 8.4 by recent guests! Quietness, heading waves crashing on the beach to rock you to sleep. Best sleep we had in all of Colombia. Beautiful trees and plants throughout makes it a nice oasis. Staff is very nice. The place is right on the beach. You cannot swim as the currents are very strong. 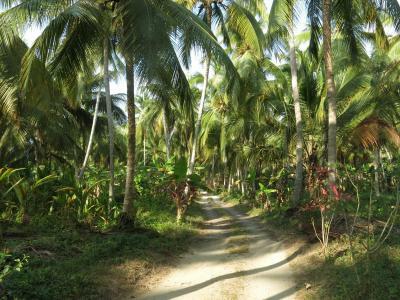 We loved the all around peacefulness of Playa Los Angeles. The private beach was beautiful. The rooms were quiet and the food was really good. It is a place to go if you want simple, quiet, and beauty. The place is amazing. Tar Lines was a wonder host and perfect personality for the front desk. The food was great and fresh and we felt right at home. Waves crashing all night outside our door. The front desk staff were great. Restaurant is not so good, both taste and service. Our group had both a glamping option and 2 bedrooms with shared bathroom, both were fine. But we then moved to Taironaka lodge 20kms away and for the same price have places much! nicer and breakfast included.. so the value is so so. You can't swim in the ocean here but its a nice beach. Most clientele were backpackers tenting. The location here is amazing. 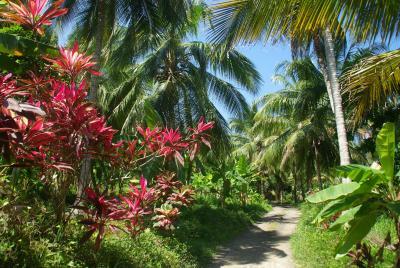 You walk off the main road into the property, and you feel totally isolated on this beach in the middle of the jungle. Our glamping tent had wood-framed walls, and was tall enough to stand in, with spots to hang our clothes, etc. The fruit smoothies were amazing, and the food was actually pretty good too with lots of options. We stayed for four days and didn't get sick of it! Beach is amazing, lots of trees all around, a great lookout to walk up to, comfortable bed, clean sheets (they did a turn down service our 3rd and 4th days and gave us fresh sheets/towels on the 3rd day). The beach is just dreamy and very private. The room was nice in the house, nice people, garden. Thank you. Playa Los Angeles This rating is a reflection of how the property compares to the industry standard when it comes to price, facilities and services available. It's based on a self-evaluation by the property. Use this rating to help choose your stay! 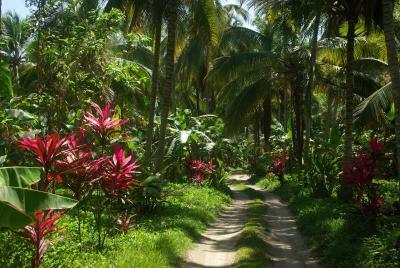 Located 1.9 mi from the Tayrona National Park, Finca Los Angeles offers rustic accommodations with direct access to a private beach. The charming rooms feature hand-carved furniture and hammocks. Some rooms at Finca Los Angeles have a shared bathroom and others feature an outdoor shower with stunning views over the surrounding landscape. Guests at Finca Los Angeles can enjoy traditional, local cuisine at the hotel´s à la carte restaurant. Fresh fruit juices are available from the bar and a continental breakfast buffet is served daily. The city of Santa Marta is a 1-hour drive from the property. Free parking is available on site and an airport shuttle service can be arranged, for an additional cost. When would you like to stay at Playa Los Angeles? This double room features 1 double-sized bed. This room is located on the ground floor and features a double bed and shared bathroom facilities. This triple room has 1 single-sized bed and 1 double-sized bed. This large tent offers a double bed and a private terrace. It is located on the beach and offers views of the sea and access to a shared bathroom. House Rules Playa Los Angeles takes special requests – add in the next step! Playa Los Angeles accepts these cards and reserves the right to temporarily hold an amount prior to arrival. Please inform Playa Los Angeles of your expected arrival time in advance. You can use the Special Requests box when booking, or contact the property directly using the contact details in your confirmation. There was only 1 female and 1 male toilet, and 1 shower to share for all of the glampers. They were in the middle of doing renos, so this will be improved, but at the moment when it is busy it is a bit inconvenient. We maintained a tab to pay at the end of the stay with the ladies at the restaurant. When we went to pay, the bill was higher than the amounts I had kept tabs of in my notebook. There were a few "Extra" items on our tab. I am not sure if this was a mistake or not (I hope so, because they were so sweet), but I was pretty upset. They allowed us to remove a few items so we got down to within 7000.00 Pesos of the amount I had in my notebook, but I couldn't differentiate between which fruit juices I had or hadn't had, so we paid a bit extra. If you are keeping a tab at the bar, make sure to also keep notes of your own! They charge 5% to pay with credit, which is a bit steep. Simple room, nothing special. You only pay for the location on the beach. Meals in Restaurant for affordable prices - was good as well. House was on the beach. The staff is ... no words. Very unfriendly at the arrival and then when we finally got the room it was not the one that we booked. We booked one upper floor and had the one downstairs, Also when we arrived, I saw feet on the upper floors balcony (resting) - when this person heared someone was downstairs, she started cleaning the balcony but in a manner that I was covered with all the dirt from first floor. The location at the beach is great - be prepared that it's not a very lonely place but many young people are glamping, camping, sleeping in hammocks etc. Would have liked a swimmable beach, but was satisfied with going in up I my knees and admiring the strong waves. Liked to disconnect but would like to have the option of wifi perhaps in an area only for travel planning purposes. Delicious place to stay away from the crowds and enjoy nature. Such a lovely spot to stay! The beach is not crowded but many times you got the beach only for yourself. The "glamping" huts are lovely. Highly recommended place. 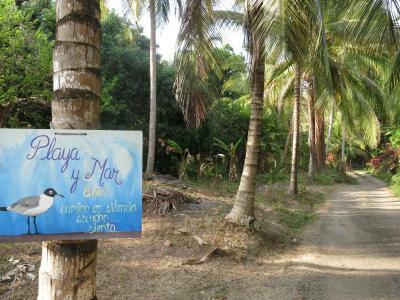 You cannot walk to Tayrona by the beach, there is a private property (Finca Barlovento) on the way. Restaurant was good as well. No wifi available anymore for the guests. The beach was not swimmable but it was still beautiful and perfect for long walks on the beach. The place did not offerr any WiFi to guests, even though they had informed that it would be available at the reception. The staff seemed not so warm but I think it is generally the case for whole of Santa Marta region and the other hotels we stayed. Quite a change vis a vis Bogota and Medellin. They dont give Wifi. It is becoming a necessity for foreign travelers to get access to wifi to do the basic communication. They can improve on this point, we are sure. The camping is located near the main entry of the park. The bus driver knows it very well and we were dropped in front of the site. The entry is lovely. Beautiful trees, plants.. The beach is lovely. Our room was facing the sea. It was neat and clean and well above the camping standings one sees across world. The restaurant has sufficient choice to order. The food was tasty and copious. We were pleasantly surprised. You should’ve able to pay with card with out the extra 5% charge, also they never change the towels when the y cleaned the room, it basic for any hotel. Otherwise the location and food was incredible, best place to connect with nature. Keep in mind that there is not internet at all. Location was fenomenal, a paradise on earth.